I see him as a Batman type; he is everywhere and manages different lives. Roydes spends about half of his time with his mom and great-grandmother and the rest of the time with his dad, stepmother and stepsister. While searching for our Recrear headquarters in Cuba, I have been staying with Roydes’ dad. There everyone is constantly joking, laughing and talking very fast and very loud. There is lots of energy- nothing is just happening: words and laughter seem to be physically moving the scene forward. Plus conversations are very dense – it never feels like small talk. 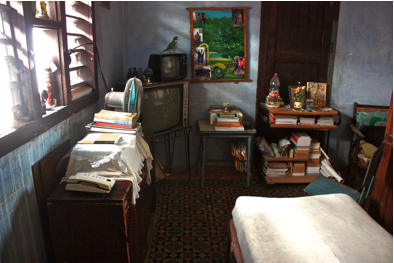 At his dad’s house, Roydes has access to a computer and to the Cuban ‘Intranet’ where he can access his university email. He reminds me constantly that ‘this is not the average life of a Cuban’ and insisted for me to come see his mom’s house. This Sunday, he could not leave the house because he had to take care of his great-grandmother. He invited me to stay with him, so today I went to spend the day with Roydes in Guanabacoa. When I arrive to his house, he introduces me to his great grandmother telling me she was born on August 13th 1908 – she is 105 years old. I want to take a picture of her, but she says that I should come back another day: she wants to color her hair and dress up for the picture. Roydes gives me a tour of his house. A closet separates a room in two parts: one side is for his mom and the other is for him. He points to his section of the room. He opens several closets to show me proudly how they are full of his books and papers. 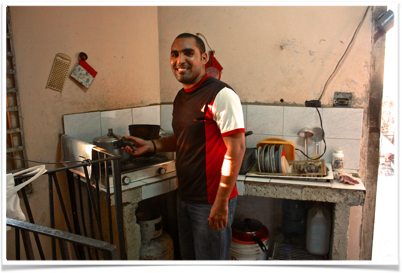 His house has a small kitchen with an electric stove and a fridge. They have no running water and he explains to me that the house is very old – built in the 1920s. While Roydes is making lunch I sit with his grandma to watch TV. In Cuba there are no commercials on television, and some sort of educational program is discussing the idea that development cannot be linked to material possessions and consumption, but needs to associated with ‘human happiness’. I sit there thinking about happiness. We eat rice and egg for lunch. He has also prepared meringues for dessert. After lunch we go walk around Guanabacoa. Roydes wants to show me the river close to his house. He tells me how he has been working with other young people in the community to improve trash management. When the trash is not picked up on time, he explains, people throw it in the river. When it rains a lot, all the trash overflows to the streets. I think Roydes likes talking more than I do (which says a lot!) and we have an ongoing stream of conversation. With Roydes and his family I am diving into his Cuba- with its ideologies, its economic challenges, and its omnipresent political undertone. A Cuba full of paradoxes and complexities. Posted in UncategorizedTagged climate action, climate change, Cuba, cuban youth leaders, inspirational, stories-from-the-field, youth leadershipBookmark the permalink.